A module is an enterprise application which is integrated with C1. Examples include 'Endpoint Manager', 'Service Desk' and 'CRM'. Each C1 module answers a specific security, productivity or management need. Together, they form a suite of tools which will streamline your workflows, increase your productivity and improve the service you provide to customers. Click 'Applications' in the top-menu to access all available modules. Note: The modules available depend on whether you have an MSP or enterprise account. See the Appendix	for a list of products available in MSP and enterprise accounts. Service Desk	- Fully fledged ticketing system which lets you offer dynamic support services to internal and external clients. Respond to support tickets, generate reports, create knowledge base articles and more. Endpoint Manager	- Manage, monitor and secure mobile and fixed devices which connect to customer networks. Also includes patch management and remote control functionality. Dome Shield - Advanced web filtering solution which provides comprehensive, DNS-based security for networks. .
Quote Manager – Powerful solution that lets you quickly construct, send and manage customer quotes. 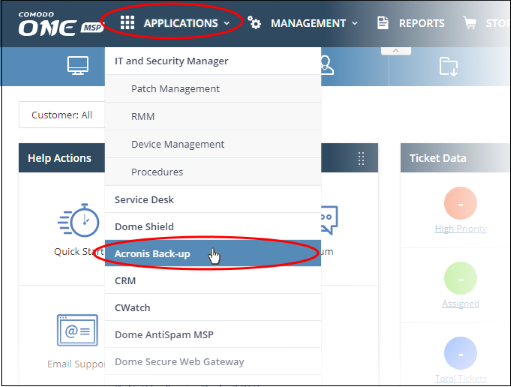 Acronis Cloud Backup – Online backup and disaster recovery. Powered by one of the leading names in business continuity, Acronis backs up any data from any source, and restores it with ease to any destination. cWatch - Cloud based security intelligence and event management product (SIEM). Comodo Dome Antispam	– Spam and threat prevention solution that uses an array of advanced technologies to prevent junk mail from entering your network. Available only to 'C1 - Enterprise' customers. Comodo Dome Antispam - MSP - Antispam and threat prevention solution that monitors email traffic on your customers' networks. Available only to 'C1 - MSP' customers. 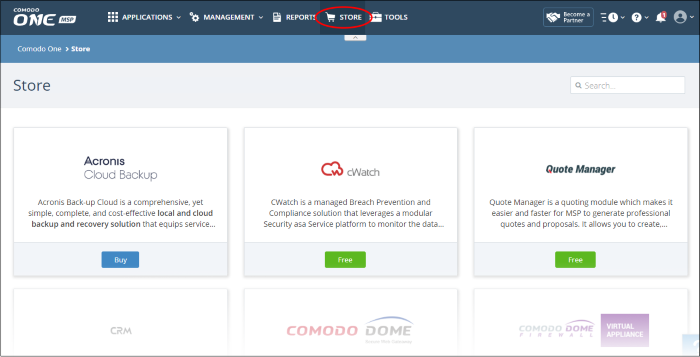 Comodo Dome Secure Web Gateway - Real time web traffic scanning solution that provides comprehensive web content and security control to your customers. Includes URL filtering, malware protection, Valkyrie real-time file verdicting and portable containment. Customer Relationship Management (CRM) - Sales automation platform. Create fluid workflows to create, nurture and close customer leads. Comodo Dome Data Protection - Data loss prevention solution. Enforce policies to control data in use, in motion, and at rest. Available only to 'C1 - Enterprise' customers. Comodo Dome Firewall Virtual Appliance - Control firewall policy, antivirus, intrusion prevention, website filtering, traffic monitoring, VPN and proxy servers. Comodo Dome Firewall Central Manager - A central console for remote management of multiple Comodo Firewall Virtual appliances. MSP/Enterprise admins can remotely monitor and manage firewall appliances on remote networks. cWatch EDR	- Endpoint Detection and Response. Unrivaled visibility into the activities of Windows endpoints on your network. View security related incidents in a detailed timeline and receive instant alerts if an attack occurs. See App Store for more details about how to add these applications to Comodo One. Note: Additional modules may require separate subscriptions. Licenses can be obtained from within the C1 console. Click 'Open Module' to access a specific app.